In an effort to simplify my summer wardrobe, I’ve been picking up pieces I know I can wear day or night. One example? This white dress you’ve seen on my blog and Instagram (more than once!). A more recent acquisition is this basic striped dress by BB DAKOTA. Once again, I’m incredibly impressed with the quality of BB DAKOTA’s pieces. Each item I’ve ordered fits perfectly and feels much more luxe than the price tag. I ended up wearing this dress twice (oops) over Easter weekend while I was in Austin. It’s just such an easy piece to wear for various errands and activities throughout the week, and just as fab an option for weekend brunch or to a casual dinner. If you’re not sold on it already, the original price on this dress was $88, and it was just marked down to $73! Such a steal for such an amazing basic, in my humble opinion. Get it here (or here!). 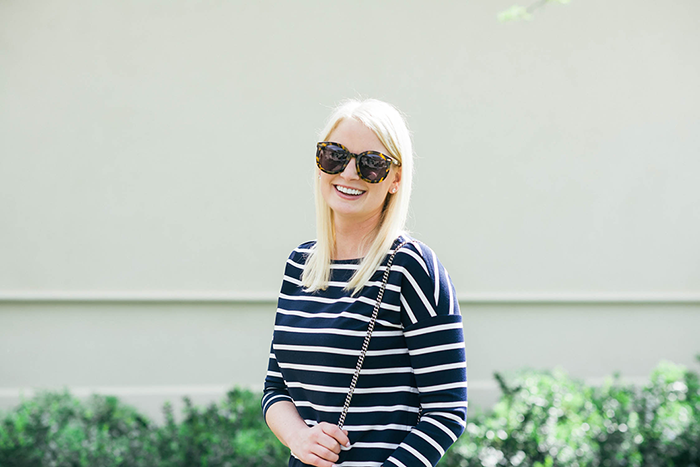 Two other items in this post I wanted to point out, are my new sunnies and summer sneakers. I tried on this pair of sunglasses while staying with Rachel a few weekends back, and just had to get a pair for myself! These really are universally flattering. I’m not usually one for oversized frames, but I just couldn’t say no! 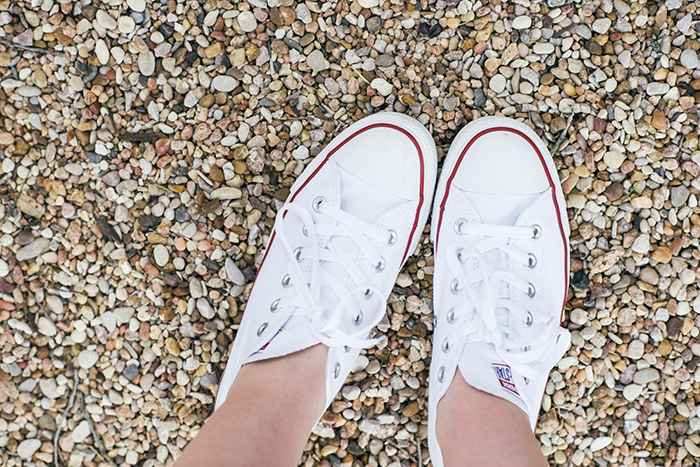 As for the shoes – I own a pair of very tattered Converse sneakers from high school (let’s just say I went through a phase…). I used to wear them every single day – they were very literally the one thing I couldn’t live without in my closet. Since those are no longer a viable option, I realized I was lacking a good sneaker for summer – I have a cute pair of metallic New Balance sneaks, but I’m not into the athletic shoe + dress combo. I recently picked up this casual pair and have been wearing them ever since. I brought them with me to the Masters this week in Georgia since we’ll be doing a whole lot of walking around. They look cool and effortless with just about anything. I’m now thinking about getting another pair in black or grey since they’re already becoming so useful! love this easy look, I picked up some converse too recently but from the Jack Purcell collection, now I want the black leather version. 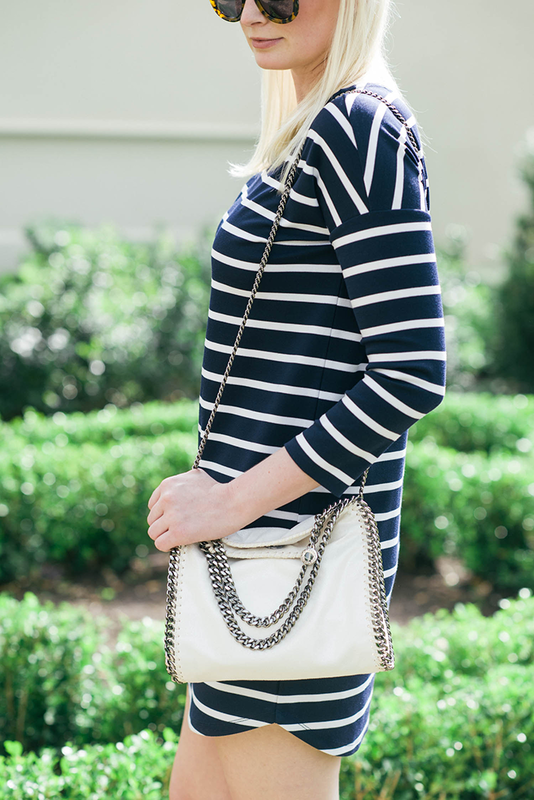 I’ve been looking for the perfect striped dress under $100 and this is it, I think! I love that it’s not all rayon and spandex like most of the ones I’ve seen.. totally don’t blame you for wearing it twice in on weekend!! You make that dress look WAY better than the stock image! I have a couple of BB Dakota pieces and, you’re right, the quality is way better than the price tag would suggest. love this look! you make it look so effortless and the mix of the converse and stripes is perfect. Such a fun and great look! Oh this is perfect for spring! I love wearing anything striped. That dress is a must! Have a nice day pretty girl. Although I love a great stripe and Converse combination all year round, doesn’t it just feel best in spring? Love the look! This is such an effortless, yet stylish outfit. Love everything from head to toe! AH! This is SUCH a cute look. Right up my alley!! Such a cute dress! 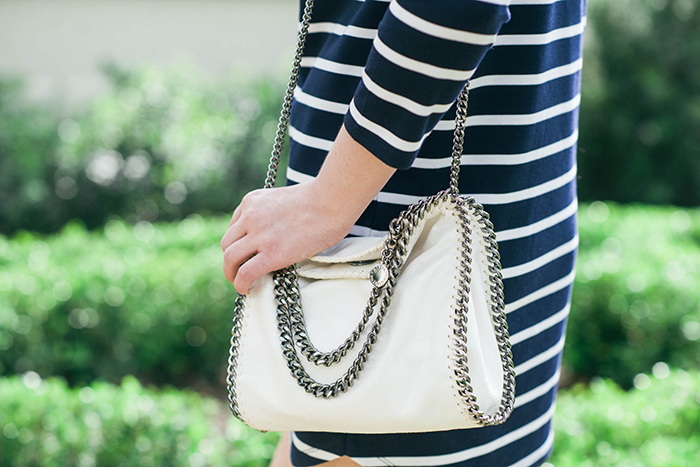 You can never go wrong with a simple cotton striped dress. And I love your tortoise sunglasses! so perfect. This is one of my spring\summer go to looks. 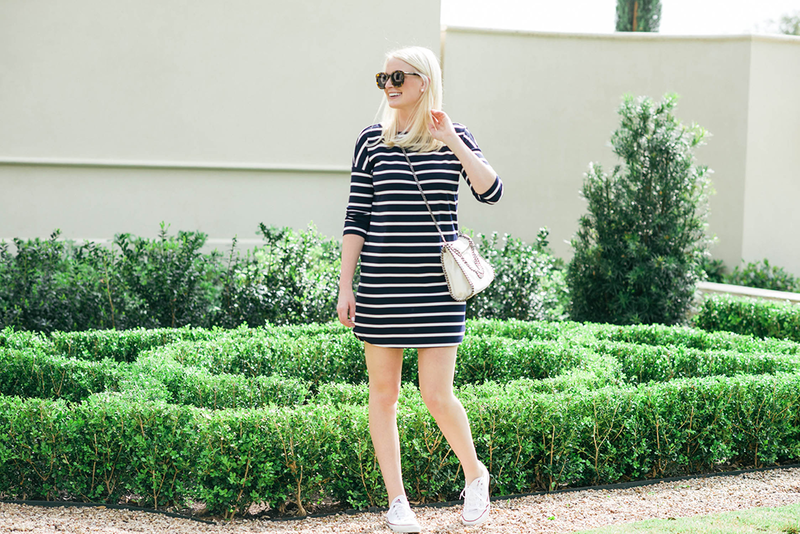 Simple striped shift, sneakers and a fab pair of sunnies. Your style is always on point and consistently makes me want to have a more edited wardrobe! Love a good laid-back, versatile dress. And the price of this one can’t be beat! Love a good stripe dress and converse outfit! Ps you have a seriously enviable handbag collection! I definitely need a striped dress like this for summer! This is so flattering and I love how you paired it with your chucks! so effortlessly chic! I love this look! That dress is such a steal!! I’m loving it dressed down with those chucks! Spring chic! So adorbale! Love this casual, cute look! 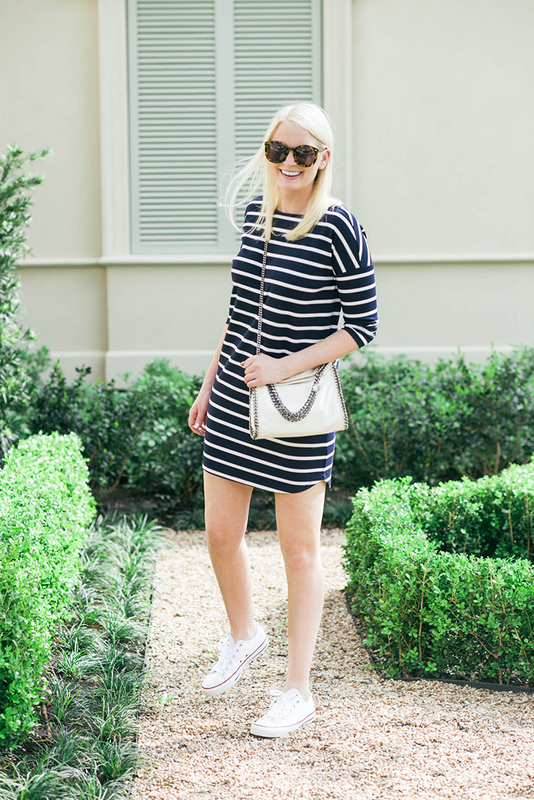 Love the sneaker dress combo, so easy but so chic! adorable beyond!! just started following and i’m in love with your style! 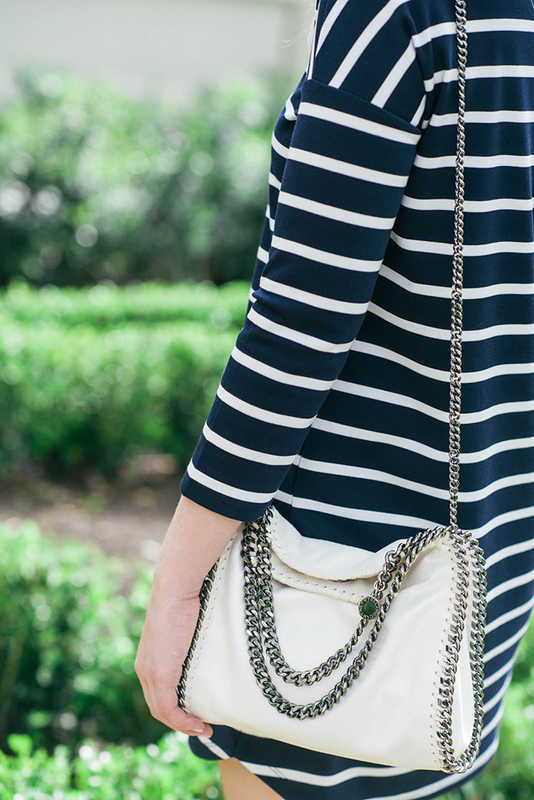 I’m on the hunt for an easy, comfy striped dress and love yours!! !